Menulog delivers for Student Biryani - Surry Hills so you'll be able to track your courier on a map. 1 x Choice of Chicken or Lamb Biryani, 1 x Salad, 1 x Raita and 1 x Choice of Drink (Can). 1 x Choice of Crispy Chicken Burger or Fish Burger, 1 x Regular Fries and 1 x Choice of Drink (Can). 1 x Chicken or Beef Haleem, 1 x Plain Naan and 1 x Choice of Drink (Can). 2 x Fried Chicken, 1 x Regular Fries, 1 x Bread Bun and 1 x Choice of Drink (Can). 1 x Choice of Chicken Karahi or Chicken Korma, 1 x Plain Naan, 1 x Salad, 1 x Raita and 1 x Choice of Drink (Can). 1 x Fish and Chips and 1 x Choice of Drink (Can). 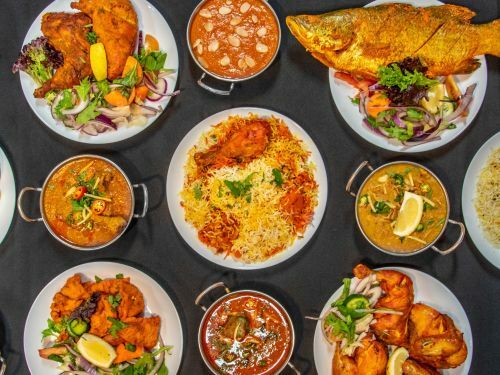 1 x Choice of Chicken or Beef Haleem, 1 x Plain Naan, 1 x Biryani Rice and 1 x Choice of Drink (Can). Serves two. 1 x Choice of Small Chicken or Lamb Biryani, 1 x Half Chargha with Fries, 1 x Bread Bun, 1 x Raita, 1 x Salad and 2 x Choice of Drinks (Can). 1 x Butter Chicken, 1 x Plain Rice and 1 x Choice of Drink (Can). 1 x Choice of Small Chicken or Lamb Biryani and 1 x Choice of Drink (Can). Serves two. 1 x Choice of Small Chicken or Lamb Biryani, 1 x Crispy Chicken Burger, 1 X Fries, 1 x Shami Kabab and 2 x Choice of Drinks (Can). 1 x Regular Vegetable Biryani, 1 x Potato Kebab, 1 x Salad, 1 x Raita and 1 x Choice of Drink (Can). 1 x Choice of Mixed Vegetable or Special Daal, 1 x Plain Naan, 1 x Salad and 1 x Choice of Drink (Can). Serves five. 1 x Family Sized Vegetable Biryani Bucket, 1 x Special Zarda (Sweet Rice), 1 x Salad, 1 x Raita and 1 x 1.25L Pepsi. Serves five. 1 x Family Sized Chicken Biryani Bucket, 1 x Special Zarda (Sweet Rice), 1 x Salad, 1 x Raita and 1 x 1.25L Pepsi. Serves five. 1 x Family Sized Lamb Biryani Bucket, 1 x Special Zarda (Sweet Rice), 1 x Salad, 1 x Raita and 1 x 1.25L Pepsi. Serves ten. 1 x Party Sized Vegetable Biryani Bucket, 2 x Special Zarda (Sweet Rice), 2 x Salad, 2 x Raita and 2 x 1.25L Pepsi. Serves ten. 1 x Party Sized Chicken Biryani Bucket, 2 x Special Zarda (Sweet Rice, 2 x Salad, 2 x Raita and 2 x 1.25L Pepsi. Serves ten. 1 x Party Sized Lamb Biryani Bucket, 2 x Special Zarda (Sweet Rice), 2 x Salad, 2 x Raita and 2 x 1.25L Pepsi. Marinated boneless chicken fillets cooked in tandoor and mixed with creamy tomato sauce. Chicken cooked with tomatoes, special spices and fresh ginger and garlic in traditional Pakistani style. Chicken cooked with yoghurt and our special spices in Pakistani style. Spanish and chicken cooked together in traditional Pakistani style. 4 different lentils wheat cooked with a mixture of boneless beef or chicken traditionally Pakistani hot curry. Authentic Pakistani spicy beef curry served with green chilli and lemon. Lamb trotters cooked overnight with onions, garlic and different special spices in Pakistani style. Lamb cooked with tomatoes special spices and fresh ginger in traditional Pakistani style. Delicious combination of fresh mixed vegetables and basmati rice. Traditional hot spices with garlic, ginger, tomatoes and yoghurt in Pakistani style. Chickpea balls and flour cooked with yoghurt and special spices. Mixed fresh vegetables cooked with tomatoes. A blend of herbs and spices. Yellow lentils cooked in the traditional way using fresh herbs, coriander and delicate spices. Spanish cooked in traditional Pakistani style served with cottage cheese chunks. Chicken marinated overnight with yoghurt and traditional spices cooked in tandoor or grilled. Minced chicken marinated in ginger, garlic, onion, fresh coriander, skewered and cooked on tandoor or grilled. Minced lamb marinated in ginger, onion, fresh coriander, skewered and cooked on tadoor or grilled. Chicken boti marinated in red chillies, ginger, garlic, onion, fresh coriander, skewered and cooked on tandoor or grilled. 2 x Chicken Kebab, 2 x Lamb Kebab and 4 x Chicken Boneless Boti. 4 x Chicken Kebab, 4 x Lamb Kebab and 8 x Chicken Boneless Boti. Served with regular fries and drink. 1 x Chicken Biryani Jr and 1 x Juice. 1 x Crispy Fried Chicken, 1 x Regular Fries and 1 x Juice. 5 x Chicken Nuggets, 1 x Regular Fries and 1 x Juice. Delicious combination of potatoes and basmati rice. Traditional hot spices with garlic, ginger, tomatoes and yoghurt in Pakistani style. Delicious combination of chicken and basmati rice. Traditional hot spices with garlic, ginger, tomatoes and yoghurt in Pakistani style. Delicious combination of lamb and basmati rice. Traditional hot spices with garlic, ginger, tomatoes and yoghurt in Pakistani style. Yoghurt blended with green chilli and mint. Green chilli with spices blended in tamarind sauce. Mango pulp with spices blended together. Potato sticks fried in oil served with salt or spice. Fine beef mince or potatoes and lentils spiced with fresh peppercorn egg crumbed and pan fried. Chicken nuggets fried in oil. Chicken with skin marinated overnight with our special spices, breaded and deep fried in oil. Fish fillet marinated overnight with spices and deep fried. Whole fish marinated overnight with spices and deep fried. Chicken marinated overnight with our special spices, steamed and deep fried in oil. Flour bread baked in tandoor. Flour bread baked in tandoor topped with butter. Flour bread with garlic baked in tandoor. Flour bread filled with cheese baked in tandoor. Crushed rice cooked in milk with sugar in traditional Pakistani style. Full cream milk flavoured Pakistani ice cream. Homemade milk shake balls dipped in cardamom flavoured sugar syrup. Sella rice (parboiled rice) cooked with sugar syrup topped with khoya and tutti-frutti. Gajar ka halwa is a combination of nuts, milk, sugar, khoya and ghee with grated carrot.